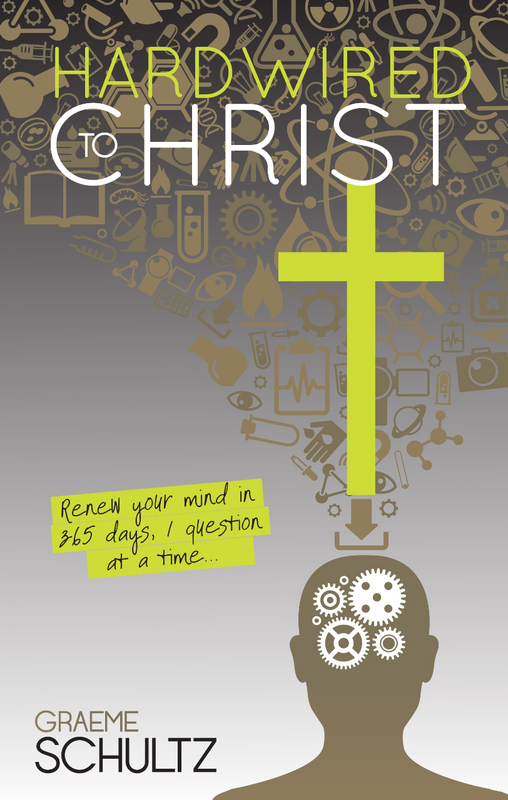 ‘Hardwired to Christ’ is a book at last. Regulars to this site will be aware that last year I posted everyday about Renewing our Minds. In itself it has been a great experience to write daily about the adventure of ‘Christ in me’ ~ and the adventure has continued into 2013 as I ground my way through the process of getting 366 blog posts compiled into a daily devotional book. Well I’m pleased to say that the task is complete and the book now exists in both softback and e-book format. Thankyou to so many of you that encouraged me in this venture. I appreciate so much that you kept pushing (gently), because the outcome of holding a book that reflects my journey with Christ, complete with a glossy cover & 423 pages is very gratifying. It’s been a process that went differently than I expected, but along the way I have accumulated a fair bit of knowledge which I am happy to share with anyone embarking on a similar journey. I chose the option of using a relatively small Australian publisher to edit, sub-edit, design the cover and format for print and electronic publishing. In effect; I paid for their expertise, which has meant that the exercise has been more costly than if you do it all yourself, but I didn’t make as many mistakes that way. There are still some formatting glitches to resolve, but effectively it’s pretty much as I hoped. For instance; the sub-editor couldn’t cope with my spelling of satan with a lower case ‘s’ ~ and a range of other little issues that will get sorted in due course… like sentences that stop and then start again in the next paragraph. I know you wont judge me on the basis of my formatting, you were all so gracious during 2012 as the posts unfolded daily ~ I don’t think anyone corrected my oft spelling & punctuation mistakes. I would like to offer you all a free copy ~ but alas I can’t afford that… sorry ~ so if you feel so inclined, you can purchase it by visiting https://www.smashwords.com/books/view/320346 for an electronic copy. It can be downloaded from Smashwords in any of the electronic formats including Kindle, Sony, i-pad and even a PDF version that can be read straight off your computer monitor. I haven’t gotten it onto Amazon yet, still a bit of tweeking to do there, so if you have a kindle it can be downloaded onto your computer first and then transfered across to your kindle by plugging in your USB lead. You will need to open a Smashwords account (which is free) to enable you to get the book. If you would like a print copy I will post it to you as it wont be available in stores for now ~ (that is a route that was way beyond me). The cost of the print version is $19.99, plus postage of $5.00 in Australia, and $10.00 in any other country. I’m sorry the cost is so high but I am absorbing the greater share of both print and postage in these prices. The way to do this is by using Paypal (you will need to open a Paypal account if you don’t already have one) , here’s the process… log in to your Paypal account ~ click on the tab ‘send money’ ~ in the ‘to’ field enter my email address hardwiredtochrist@mail.com ~ enter the $ amount, including postage ~ then click on ‘pay for goods or services’ ~ and then press ‘continue’ ~ then click on ‘choose shipping address’ and enter your postal address for delivery ~ finalize payment by clicking on ‘send money’. (If you are in Australia pay in $AU, all other countries pay in $US). I apologise if this has all become something of a commercial exercise for you, I really dont want anyone to feel in anyway pressured to buy the book ~ I dont want this to become all about me, when it’s really all about Christ ~ you know what I mean. If you do get a chance to read it feel free to add a review on Smashwords ~ and please give me your feedback, good, bad and indifferent. I’m going to continue posting about ‘Christ in me’ on this site http://www.hardwiredtochrist.wordpress.com drop in anytime and say hello. « CHRIST IN ME – part 7. Awesome Graeme, very proud of the work you are doing. It is exciting to see all of the good things the Lord has for you and your family. You have always been of great encouragement to me. Your words have always pointed me to Jesus Christ and His finished work. Keep up the good work, you are blessed and highly favored! your up late / or early – any interesting parcels arrived at your door today ?? You flatter me, and I appreciate you want to direct others my way – thanks. I will think a bit more about the award, but happy to answer the questions. Good to see you put pen to paper, even if it not exploring the deepest thoughts of Diane – plenty of time for that.